Kevin: This episode largely works. I say "largely" because I think a lot of the tonal stuff they set up ranges from moderately interesting to really compelling. I like every of the too few trips to Janeway's holonovel. I also really liked the way they worked in the elements of the story into Janeway's hallucinations. The jump cut from her quarters fighting with with Mrs. Templeton to sickbay was really nicely done. Star Trek has done many episodes where we watch the characters question their grip on reality, and they're almost all really fun. The little touches like the teacup was nice too. Matthew: Totally agree on the holonovel. 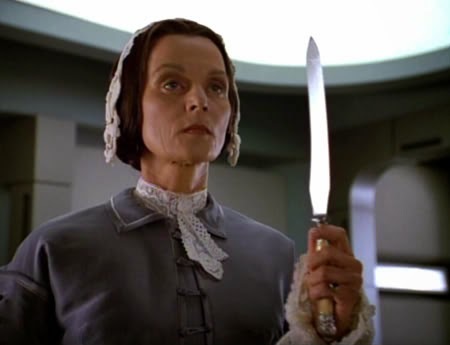 It would be a fun diversion as it is, just a slice of life, but when Carolyn Seymour jumps out at Janeway with a knife in her quarters? Hell, yeah. Anyway, these sorts of reality questioning episodes are my cup of tea, too. If I have a criticism of this one, it's the structure. At first, we think it's going to be about Janeway only, and personally I got invested in that. The abrupt shift to the whole crew was jarring. If the script had perhaps shown a gradually increasing effect in many crew members, I think it may have been a tad better. Kevin: I have two main complaints though. First, the episode falls into the pitfall for these kinds of stories. The middle third of the episode drags a little for me when we start cataloging the crew's various fantasies. Even as a young viewer, I remember girding myself a little to wait through the list of the rest of the crew before we moved on with the story. The other problem I had was the "latent B'Elanna attraction" story. There was nothing before or after this episode to indicate she was attracted to him. The hard right of that kind of plot development tends to pull me out of the story. Matthew: Actually, tonal shift notwithstanding, I like the thought of seeing each crew member's personal weakness. The danger is that each story has to live or die on its own, and I agree that B'Elanna's is weakest. I really like getting a look into each character's private thoughts and hidden fantasies. The use of Mark's voice and eventually image was a lovely look into Janeway as a person with emotions and regrets, and it makes the whole Voyager scenario that much more real. The problem I had with it overall is the notion that one alien (apparently) is doing all of this mind-altering on his own. Can he really handle 150 people at once? Kevin: The resolution was solid, overall. I liked the development of Kes' latent mental powers. The alien himself was interesting, and certainly menacing, but I think the "Because I can" line worked better on paper in the writers' room than it did on the screen. It feels like a dodge. And if he wasn't ever really there, how did Kes resist him, and how do we know he's actually gone? Had the episode leaned a little harder on the "Is any of this real?" question, the ending would have been a little stronger. As it is, the alien himself was interesting and a little scary, but the episode kind of just...ends. Matthew: Yeah. Doing it because he can just elides the question of motive, which I think is an interesting and necessary one if you're going to show the villain. In truth, they could have just left the alien out entirely. That would have been a real mind-$%&*, eh? Kevin: Everyone turned in a good job this time. Mulgrew's scene with Carolyn Seymour was awesome. The jump of her to the scene is Sickbay was great. I also really liked Lien this time. Her determination had the right pitch, like it was an effort, but a doable one, for her. It read as natural character growth. Matthew: The Mulgrew stuff that really stuck out for me was her annoyance in the teaser, and her trepidation while alone (sans dialogue) in her quarters. When an actor can hold my attention alone in a room with no words, you know you've got a good one. Kevin: I am going to single out Picardo again for praise. His scene with Mulgrew in Engineering was hilarious, and a real coup given that they both must have been acting to off stage production assistants. Matthew: Jennifer Lien can sure scream. It really was "blood curdling," and it totally added to the already gruesome effect mentioned below. Any excuse to get more Carolyn Seymour into our lives is a welcome one - she knocks it out of the park yet again. Her arch reading of "I see" alone was enough to make me smile and send me along on the rest of the episode's ride. Kevin: In the plus column, Janeway's holonovel always looked great. Hair, costumes, sets, they are all gangbusters. Oddly, according to Taylor, the Gothic romance wasn't getting the audience response they hoped, and that's why it wasn't brought back. Not for the first time, people are stupid and wrong, and Matt and I are correct. The novel actually accomplishes the hat trick of giving Janeway a credible hobby that even while being explicitly romantic in nature never gave the impression she was just secretly waiting for a man. Visually stunning and credible plotting equals good idea. Stupid people with their stupid responses to things... Anyhoo, the other big success of the episode was the seeping sores. Those really, really, upset me as a kid. Matthew: Totally agreed on the holonovel, yet again. Carolyn Seymour in particular was dressed and made up really well. It's amazing how different she can look from her Romulan and Malkorian roles. Those kids are really well coiffed and outfitted, too. It's just such an interesting tableaux for stories, it was a shame to see it dropped. Kevin: The alien was a bit of a standard issue Westmorehead, and I thought the ship was a cop out. I get that they were going for mysterious back lighting, but it just looked undeveloped to me. Matthew: The space scenes confused me. What were all these extra ships? Just models lying around the studio? It led to confusion with the story. They're said to be radio controlled. Is there just one Bothan then? He stole them? I was tickled by seeing Vulcan in Tuvok's hallucination, but the effect was not very good, and I would much rather have seen his house than a generic mountainscape. Kevin: This is a solid 3. I enjoy a lot of this episode. A host of character and tone moments really make this one interesting to watch, but I don't think they take it anywhere enough to make it 4. Michael Piller apparently said, "The show turned out particularly well, yet it's not a show that is about anything." A more concise description could not have been said. Matthew: This was so close to a 4. A better villain or none at all might have done it. Alternately, a deeper focus and look into the fantasy of just one character (Janeway seems best) would have as well. But it's still a fun show that almost transcends its flaws. I agree with the 3 for a total of 6.